Chengyun Hua applied for a Liane B. Russell Distinguished Early Career Fellowship after meeting ORNL researchers at a Society of Women Engineers conference. October 13, 2017 – In Chengyun Hua’s research, everything revolves around heat and how it moves. 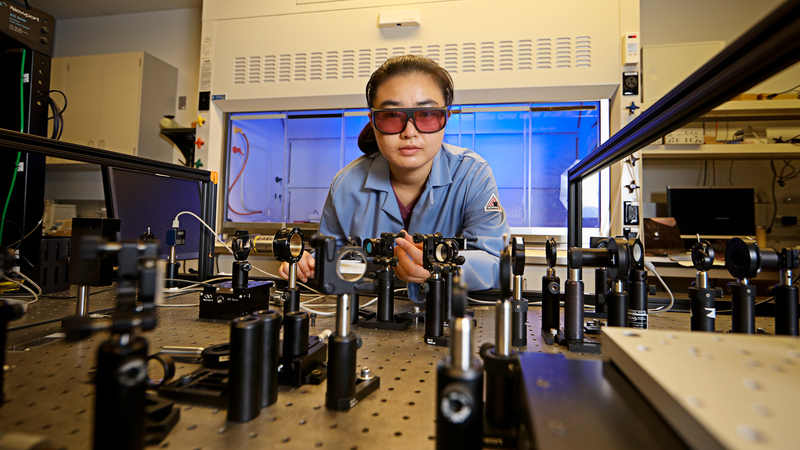 As a Russell Fellow at the Department of Energy's Oak Ridge National Laboratory, Hua carefully analyzes nanoscale heat transfer mechanisms using laser spectroscopy. Although heat has the potential to generate enough energy to power the universe, if not channeled properly, it can also become problematic. Through Hua’s work in ORNL’s Building Equipment Research group, a new ultrafast optical technique for thermal measurements—time-domain thermoreflectance—was deployed at ORNL for the first time. The technique measures the thermal properties of materials, including thermal conductivity. Using ORNL’s Ultrafast Laser Spectroscopy Laboratory, Hua measures material conductivity down to the nanometer. Hua grew up a world away in Shanghai, China. An only child of accountant parents, she excelled in mathematics and science, something that was not unusual in her home country. “It’s easy to get a job in the engineering discipline in China; it’s a highly respected profession,” she said. For Hua, however, getting accepted to study engineering physics at the University of Michigan, Ann Arbor, was an opportunity not to be missed. Hua completed her PhD in mechanical engineering at the California Institute of Technology at Pasadena. There she met an advisor and professor who helped steer her current career path, challenging her to continue focusing on nanoscale heat transfer properties. “Cal Tech was a unique playground if you love mathematics and physics,” she said. After meeting some ORNL researchers at a Society of Women Engineers conference, Hua made the decision in early 2016 to apply for a fellowship that would allow her to focus on micro- and nanoscale heat transfer and energy conversion at the lab. The Liane B. Russell Distinguished Early Career Fellowship attracts scientists who have demonstrated outstanding scientific ability and research interests that align with core capabilities at the lab. “My advisor encouraged me to apply and within one week I wrote my proposal on ‘Exploring Thermal Transport in Nanostructured Materials for Thermal Energy Conversion and Management.’ I interviewed in November 2015 and four days after the new year, I was invited to become a fellow at ORNL,” she said. Uprooting again to East Tennessee, Hua has found a supportive community that encourages the sharing of new ideas and interdisciplinary research. While Hua has adapted to many moves and changes, one part of her research and studies remains unchanged.